← Catchall: a receptacle for odds and ends. As you know, last week I went to the shelter and sprang Ms. Slupe out of there. In the car, I felt like we were Thelma and Louise getting the heck out of dodge. Poor kid had been there two stinken years. Can you imagine living in that room for two years without a break? No birthday or Christmas. No vacation. Not even a staycation. Every single day and night dealing with new cats and sometimes kittens. Wondering who might stalk you. Who might annoy you. Who might nip you on the tush. Who will kick you off the cat tree, out of the litter box, or away from the food bowl. Listening to dogs bark on the other side of the wall 24/7. Seeing and hearing the sad stories of other cats. Never being able to put down your guard and just stretch out and put up a leg and lick yourself leisurely. Slupe had a reputation at the shelter. Not a bad one. But not a good one either. Slupe kind of faded into the background, got holes in her fur (from stress), shrank from touch or occasionally nipped if someone persisted. She resisted going in a carrier. She wasn’t a candidate for PetSmart adoptions. But she and I clicked, and I knew she was a very very sensitive soul. It got so that even though I still have Kana/Tiger troubles I couldn’t let her stay at the shelter a day longer. Who knows when some new cat would bring in a disease or ringworm and Slupe would have to go back into ISO until she was better (ISO is way worse than living in the roaming room). Without the ability to go to PetSmart and without a personality that would garner attention from visiting potential adopters, Slupe was doomed to stay much longer than two years. So she’s here now. I have no idea what the future holds for any of us, but she is reveling in the peaceful sanctuary of her new bedroom. From the moment I opened the carrier to let her out, she has been the sweetest, gentlest, most loving and curious cat!!! Everything I wrote in paragraph three is all wrong: that isn’t Slupe. That was living in the shelter for two years. This is Slupe. Slupe has the radio, a CD of birdsongs and one of whale music, and then I let her listen to my daughter singing on my iPhone. 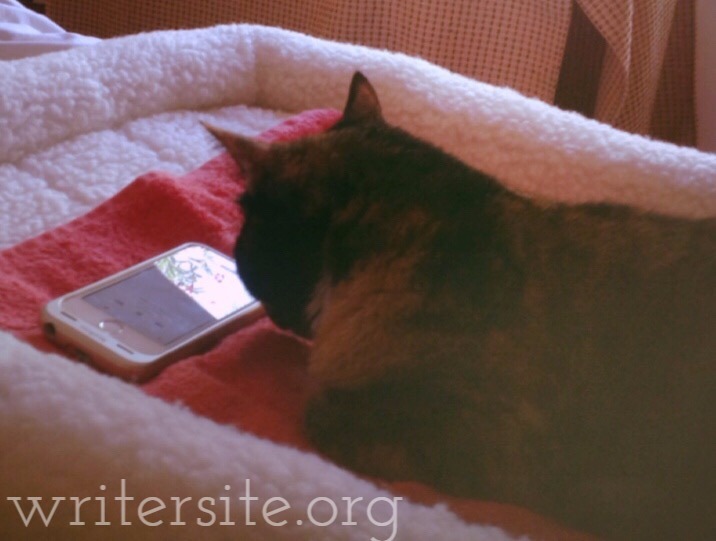 She was amused at her version of “The More You Ruv Someone” from Avenue Q, but when my daughter’s “Different Drum” (the same one Linda Ronstadt sang) came on, she came right up to the cell phone and almost lay down on top of it so she could listen up close. Later, I repeated the song, and she was mesmerized all over again. I’m not surprised. I like it, too, and Slupe is my buddy. So let me tell you what my mother said. Heh. “I’m not sure I’m going to tell anybody you got a 5th cat. It’s been hard enough to tell them you have four cats.” Bahahahaha. Yup, that’s Mom. Her way of telling me I’m a crazy cat lady, and that it matters what her friends think. The jury is still out on whether I did something really stupid or if this will all work out. I was glad that hubby was game to help her, too. When have you done something on impulse even though you knew it was going to be a big production because you thought it was the right thing to do? Hi, guys ;)! Same to all of you!! Thanks for stopping by. Hahahaha, I like how you taught him a lesson. Was it somebody trying to trick people? We have someone here who calls from the “Internal Revenue Service” (not) and threatens people. They are really targeting immigrants who get frightened that the cash they received for labor and didn’t pay tax on is going to land them in jail. It’s horrifying that these calls are allowed to go on and on and nobody is ever prosecuted. Oh man, why are there so many creeps? I’m so happy for Slupe. May you all be happy together for years to come. When I went to see about a german shepherd/husky mix puppy, I arrived to a growling maniac of a puppy who wasn’t fuzzy in the least. He hated me. But the next day he was going to be taken to the shelter and put down. I knew I was nuts, but I took him home. You’ve read the stories. Goliath was the best thing that happened to me during those 10 years he was with me. But I still shake my head at the fact that I took him home. Elyse, thank you so much. I HOPE I can keep her, but if not, I won’t let her go until I’m sure that the Dalai Lama or Jesus wants to adopt her. In other words, not just anybody! But I hope I get to keep her myself ;). I love the remind about your sweet and crazy dog and the stories you’ve written about him. What a wonderful love story you have had! I went to drop off old towels at our shelter and there was a one-eyed cat. I thought it was an old cat without much prospect of getting adopted so I took it. As it turns out it was a young cat (about 9 months) and the best cat ever. She is the only cat that isn’t afraid of new people. She will not bolt and will spend time under an end table when we have a party. Of course she comes out to be adored first. I never regretted it. She was #4 at the time. I have since lost one so I’m down to 3 cats. I had someone say to me just last week, “you have 3 cats?” like I was in the crazy cat lady category. My response was, “I had 4 but lost one last fall.” Walk tall crazy cat lady. I only hope you can resolve the Kana-Tiger issues to make the home more peaceful. I love that “walk tall crazy cat lady.” That is just exactly what I needed to hear. I don’t have to hide it! (so there, Mom) Aw, i love that she demands her adoration from fans! Thank you so much for taking a one-eyed cat. We think that we are helping them, but then they enrich our lives! A blogger friend of mine (who is very normal — I met her in person) has 9 cats. So crazy starts after that. Andrea, aw, I love to hear that they all just did their own thing. Sometimes that is the best thing to hope for (unless you happen to get some that cuddle in a big tangle on the bed, but those are not mine haha). OK, now you mention tortoiseshell. So interesting. 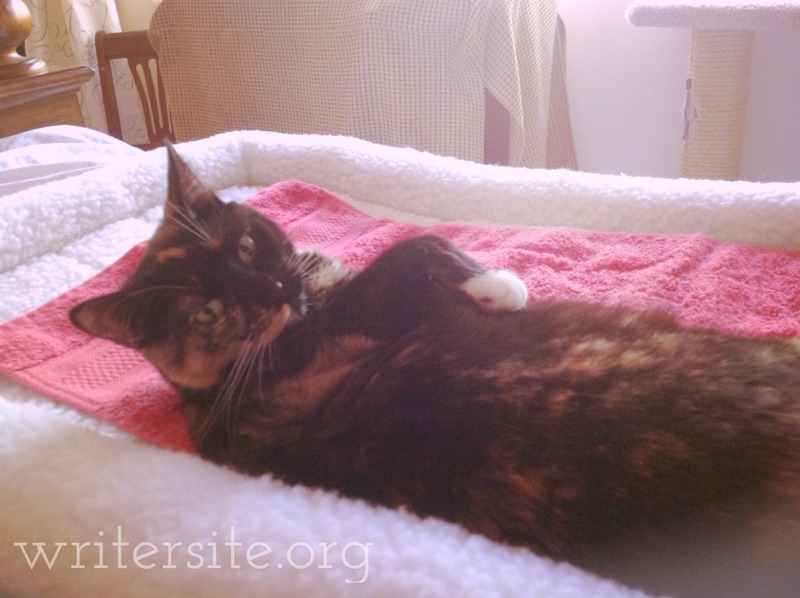 At first the shelter had Slupe classified as a tortie, but then they changed it to calico. I can never really figure out the difference, so I just looked it up again. Apparently in the US and Canada if they have the 3 colors they are usually called Calico, whereas if they only had tan and black, for instance, they are called torties. Slupe has amazing looks–her back looks SO tortoiseshell with its tan and black in a small repetitive pattern. But then her stomach and limbs are very calico-ish with bright white, black, and tan. I guess she is both! I always just assumed Calico was American / Canadian for Tortoiseshell! Jesse had a white bib so maybe had a little Calico in her! I did. I rescued a cat two summers ago, but I ended up re-homing her. It was very sad, and I still gulp a bit when I see her photos, but I know she has a good life now. Even living here, terrified of half the people and all the animals, I bet her life was better than at the shelter. I remember you talking about her. Very distressing, but if you can find a better home, that is the important thing–that the cat is as happy and comfortable as possible. There is no shame in seeing to her best interests, even if it’s not at your house. You can feel so grateful and pleased that she is having a good life!!! Slupe is happy to have you! She’s such a cutie! She’s just so darn cute! Well, quitting my job was an impulse…LOL. I’ve been wanting another kitty too. Nothing wrong with 5 of them! And probably a really really good impulse, too, from the way you have described (and not described) it. Yes, you definitely need another kitty. Another subject for your photography!!! So glad you brought Slupe home!!! Such a sweet cat. I hope all will go well with all five cats. Your description of the pressures of being at the shelter is so moving, Luanne. Actually, getting Acey was somewhat impulsive. Dave left the newspaper clipping on my desk at home, his subtle hint to tell me to buy a puppy from the bichon frise litter in Hemet. I was having dinner with John Kirwan that day, so afterwards, he drove out with me to the huge Hemet ranch where Acey was born. Price: $700. Money I did not really have, but some of the best money I have ever spent. The breeder/owner told me to prepare for his grieving, that he might cry and wimper for the first couple of nights. No grieving. He was so happy from the minute he got here, and he and Dave had instant bonding when Dave picked him up. I don’t think he had ever been outside on the big ranch; the entire litter was situated in the kitchen (super large kitchen), and they ran around in a little clump. He loved a little grassy area by our patio, and that first week he seemed so thankful that we picked him over the others to take home. How I miss him. Hope the others will get along with Slupe. Kana and Tiger are still having a difficult time? Carla, I loved reading your story about Acey. What a sweet boy. He was a part of your family for a long time, but I’m sure it doesn’t feel long enough. How could it? I did let Slupe come near the others today at breakfast time, and as I carried her past them, they all looked up at her and she looked at them. Nobody reacted. I think they were thinking: ah, she’s a little one; shouldn’t be too much trouble. She was thinking: oh man, a lotta cats here. Haha, no, I didn’t sing it! I just put the recording on a 2nd time for Slupe. She still loves it, too! She is such a blessing to me. I so hope I can keep her. I keep begging my other cats ;). You absolutely had to take Wendy home!!! I’m sure she loves living with you! Slupe is very happy here. I hope she can stay. Keep your fingers crossed. I am writing this with the news on right now with coverage of Orlando. My heart is so heavy and my stomach is upset. Grumpy bunny?! Oh no! Can you figure out what is wrong with him? I will try to remember when I meet hubby not to tell him hahahaha. Slupe is so adorable. I can hardly believe I am so lucky to have her here. Please keep your fingers crossed that she gets along with the others and can stay.